The gun debate has become one of the top issues in the upcoming election due to the involvement of the Parkland students who survived the recent school shooting in their hometown. 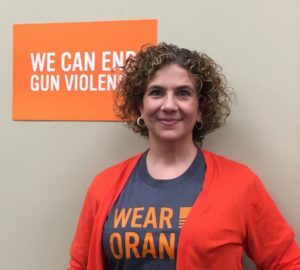 I joined Moms Demand Action for Gun Sense in the aftermath of the Sandyhook Massacre. Ever since, I have been learning more about this amazing organization and working with my local chapter to raise awareness of the toll that gun violence takes on our society. I am very proud to announce that I have been named a candidate of distinction by Mom’s Demand Action for Gun Sense. Reducing and preventing gun violence is a public safety issue, not a political one. Over 35,000 Americans are killed every year by gun violence and thousands more are injured. Responsible gun owners know that supporting the Second Amendment goes hand in hand with common-sense solutions to reduce gun violence. Common-sense public safety measures make our communities safer and save lives. Common-sense public safety measures make our communities safer. On average, 96 Americans are killed with guns every day – and hundreds more are wounded by gun violence. For every person shot and killed, two more are wounded. This issue affects every community, all Americans, and isn’t partisan. That’s why we must address gun violence in all its forms. The vast majority of American Voters – 97 percent – including 97 percent of gun owners, support criminal background checks on all gun sales. Since background checks on gun purchases at licensed gun dealers went into effect in 1994, more than 3 million gun sales to convicted felons, domestic abusers, people with dangerous mental illnesses and other prohibited purchasers, have been prevented from purchasing a gun. We know criminal background checks work, but we must make sure they take place on all gun sales. As it currently stands, federal law doesn’t require criminal background checks for gun sales by unlicensed sellers, meaning that felons, domestic abusers and other people prohibited from having firearms can easily and legally buy guns, simply by going to an unlicensed seller – including strangers met online or at gun shows. Iowa’s gun laws have been significantly weakened in the past few years – and that flies in the face of common sense. I will be a strong advocate for universal background checks and improving Iowa’s gun laws to make sure we are doing all we can to keep Iowans safe from harm.